This is the kind of study that the media love: Researchers from Purdue University report that adding a half teaspoon of cayenne pepper to your meal can reduce your appetite and cause you to burn more calories. Count on seeing this new “fat-burning tip” popping up on magazine covers and internet aggregation sites. Before you get too excited, however, it pays to look beyond the headlines. Exactly How Many Extra Calories Was That? 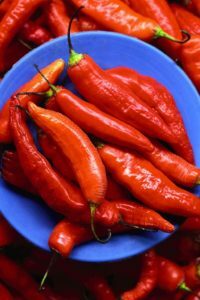 It’s true: Subjects who ate meals spiked with cayenne pepper burned more calories over the next five hours than those who ate the same meal without any pepper. And just what did this metabolism-revving, calorie-burning bonanza amount to? An extra 2 calories per hour, for a total of ten additional calories. Whew. Don’t spend it all in one place! And For Best Results, Don’t Make a Habit of It! In terms of the effect on appetite, the results were a bit more meaningful. Eating a spicy meal led some subjects to shave about 150 calories off of their next meal. However, this appetite-suppressing effect only seemed to work in people who don’t normally eat spicy foods. Those who habitually eat “hot” foods got no appetite-suppressing effect. So it works, but only if you don’t do it…which would seem to undercut the usefulness of this strategy. I don’t want to give the impression that I’m dissing the work of these investigators. The results are actually very interesting, giving rise to all sorts of interesting new questions and possibilities for useful research. But as a weight-loss strategy–which is how this will play in the mainstream media–it is virtually useless. Seasonal Vegetables: Spring Cleaning for the Body? My best ideas on healthy living in your inbox. The content provided by this site is for informational purposes only and is not intended to provide personal medical advice. Copyright © 2011-2017 Monica Reinagel, Reinagel Communications, LLC. All rights reserved.